Iran is testing missiles right as the nuke deal goes into effect. Awkward. Missiles are displayed during an exhibition on the 1980-88 Iran-Iraq war, as part of the ‘Sacred Defense Week’ commemorating the 8-year war on September 28, 2014 at a park, northern Tehran. 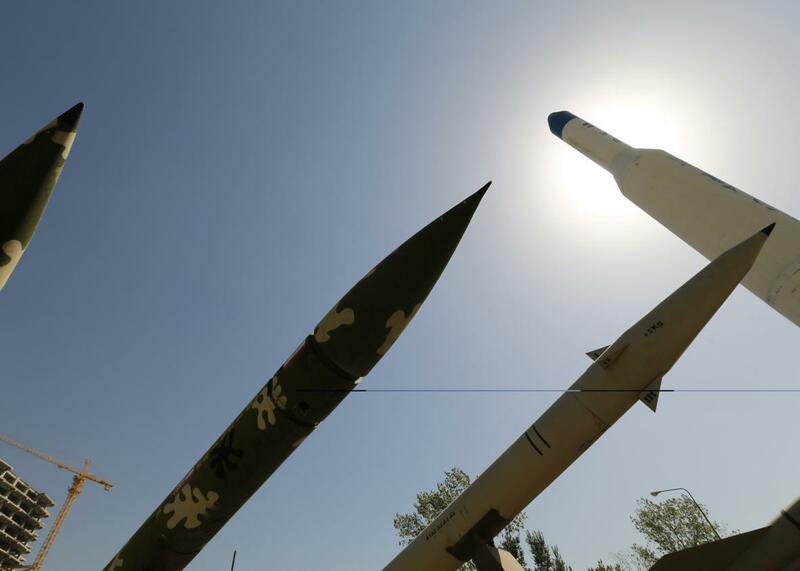 The U.S. planned to raise a recent missile test by Iran at the U.N. Security Council on Wednesday, accusing it of violating a U.N. ban on tests of nuclear-capable missiles. U.S. Ambassador Samantha Power said several days ago that a medium-range ballistic missile test-fired by Iran on Oct. 10 was “inherently capable of delivering a nuclear weapon” and therefore in violation of a 2010 Security Council resolution, which should result in sanctions against the Islamic Republic. Iran, which denies having a military nuclear program at all, has disputed that the missile was designed for nuclear capability. This puts the Obama administration in the awkward position of criticizing Iran internationally for an alleged nuclear-related violation while defending the recent nuclear deal to domestic critics. The test was Iran’s first since the deal was reached in July. “Adoption Day,” the date on which the provisions of that deal started going into effect, was on Sunday. This week also saw the deal receive a lukewarm endorsement from Iranian Supreme Leader Ayatollah Ali Khamenei, who had previously been hesitant about weighing in on an agreement opposed by many hardliners in Tehran. The U.S. administration maintains that Iran’s test, while in violation of previously adopted U.N. measures, is a separate issue from the recent deal. Under the deal, the U.N. embargo on Iran’s ballistic missile program will be lifted in eight years if Iran continues to refrain from nuclear enrichment activities. It’s true that the deal is still worth pursuing even as Iran continues to violate other U.N. measures and to imprison U.S. citizens—the deal was never intended to put an end to every Iranian activity that the U.S. objects to, just to keep it from building a nuclear bomb. But it certainly doesn’t bode well for the optimistic notion that the deal could lead to U.S.-Iranian security cooperation beyond the narrow areas laid out in the agreement and it certainly doesn’t look good for the administration. Iranian leaders were presumably well aware of this.